The new home sales need to be watched closely now. There are a number of emerging and actual headwinds. Real GDP growth was reported at 2.6% in the 2017 4th quarter. This was the government's first estimate. News Release: Gross Domestic Product I would not pay that much attention to the first estimate. I do view the decline in the savings rate to 2.6% as important. The rate was 3.3% in the third quarter and has been declining since October 2015. Personal Saving Rate | FRED | St. Louis Fed In November 2007, the rate had declined to 2.5%. The current low savings rate is frequently seen at tops in consumer spending. The decline in the USD will provide a tailwind for U.S. inflation as will the imposition of tariffs. As previously discussed, several technicians believe that this break-out will result in the yield rising to 3%-3.05% with little resistance. A convincing move above 3.05% would break the long term trend-line going back to 1981, the start of the long term secular bull market in bonds. The Bond Bookies currently see a 79.7% chance that the FED will increase the FF rate by .25% at its March meeting. That includes a 2.9% probability of a .5% increase. I would assign close to a 100% probability. The only reason why I would not now assign a 100% probability is due to the remote possibility of a Black Swan event that changes everything. The Bond Ghouls see the odds of a .5% rise on or before the December meeting at 89.7%. The odds of a .75% increase is more probable than not at 60.9% with a meaningful though still low odds of a 1% increase that would take the range between 2.25% to 2.5%. So, what is going to happen to the U.S. governments budget deficit in 2018 with that forecasted rise in short term interest rates (made worse by increasing in intermediate and longer term rates), the massive tax cuts and the overall continued substantial increases in government spending? Short term treasury bills and notes are already rolling over a much higher rates than one year ago. I am at a loss to explain why politicians and others believe that foreigners are going to finance U.S. budget deficits in perpetuity. We may start to see a sea change in their willingness to do so as the year progresses and that may accelerate in the coming years in response to Trump's U.S. protectionist policies. At least Donald et. al. will be able to more effectively control the Fake News media when the U.S. government controls the spectrum. A Quinnipiac poll released last Thursday found that two-thirds of Americans believe Trump is not a good role model. A majority of every group, with one exception, believe that he is not a good role model. The one exception is of course republicans, with 72% saying Trump is a good role model for their children. National (US) Poll - January 25, 2018 - Trump Is No Role Model Personally, I think the republicans need to show the Access Hollywood tape to their grade school children once a week. Both the WP and NYT reported that Trump ordered Donald F. McGahn II (White House Counsel) to fire Mueller back in June 2017, shortly after Trump fired Comey. According to those reports, McGahn refused and threatened to resign. Trump thereafter relented and made a public statement in August 2017 that he never even considered firing Mueller. Trump fired back that the reports are Fake News. Any news that Donald does not like is Fake News. Mueller has taken testimony from McCahn and other WH insiders including Priebus. The purported "conflicts" that Donald was going to use as justifications were bogus. Donald dodged an obstruction of justice bullet by backing off. Firing Mueller shortly just after firing Comey would have been tantamount to pleading guilty to obstruction of justice. What can you say about someone who actually thought about obstructing an obstruction of justice investigation in plain view. Idiot! That is what Trump would have done by firing Mueller. Trump can now at least argue that the idea came from one of his lawyers-maybe, and he did not carry though based on advice of counsel. That is the language of a Demagogue. I would make a couple of observations about Grothman's statement which is typical for GOP politicians. Second, Mr. Grothman's White Nationalism and desire for racial "purity" are apparent from that quoted statement. Providing a path to citizenship for Dreamers, who have not committed serious crimes, would "ruin America" and "be the end of America." And it is merely a coincidence that those Dreamers have mostly brown skins while Mr. Grothman's constituents have mostly white skins. Grothman's congressional district has about 600 registered Dreamers. Interactive Map-Center for the Study of Immigrant Integration (CSII) at USC That statistic alone proves that Grothman is engaged in demagoguery. The average population of a congressional district is 710,767. Many of those Dreamers have probably already figured out that they are not welcomed in Grothman's district. My congressional district (Tennessee's 7th) has about 400 registered Dreamers. The GOP representative, Marsha Blackburn who is now running for Senator Corker's vacant seat, has similar views to Mr. Grothman. It is interesting that the hard line immigration stand is dominant in rural America, which overwhelmingly supported Trump, where there are relatively few illegal immigrants. Yet, as the republican story goes, it is those immigrants that lack Christian values (meaning protestant as opposed to Catholic) and are taking the jobs away from white people, committing crimes, selling drugs, living off the public dole, and just changing America for the worse (meaning more non-whites). If you go back in time in the U.S. the same would be said about the Irish, eastern Europeans, Germans, Chinese, Jews, Catholics, etc. and so on. The new "them" and "others" have brown skins. The illegals in the rural areas work in jobs that whites would prefer to avoid, including farm and other hard labor jobs like working in chicken, hog and cattle slaughtering factories. In a way, it would be fitting for the hardliners, who own small businesses that sell products and services, or own farms who depend on their labor, to lose the immigrants as customers and workers. The job problems in rural America are not caused by the few illegal immigrants living in those areas, but to other causes including the loss of factory jobs to foreign competition and the relocation of plants to overseas locations. Job growth and opportunities lie elsewhere, so the best option, particularly for the young, is to just leave and go elsewhere. But, generation after generation remain in areas likely to suffer economic stagnation or worse and consequently unlikely to present financial opportunities. Trump and other republicans prey on their fears and insecurities through their immigration demagoguery. Hillbilly Elegy: A Memoir of a Family and Culture in Crisis - Kindle edition by J. D. Vance @ Amazon.com. Will Trump ever testify notwithstanding his talk that he is looking forward to doing so under oath? I doubt it. Talk is cheap for Trump. 1. Small Ball: I received one quarterly dividend for each stock mentioned below which I intend to use as a down payment on my first minute in a nursing home when that option becomes necessary. I used commission free trades for all transactions. I bought back 10 shares of PG at $88.33 that was sold at $91.59 a few days earlier. I just thought that the market slightly overreacted to the earnings report for the second fiscal quarter ending on 12/31/17. 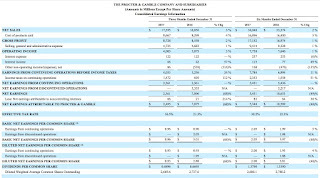 PG will benefit in its GAAP earnings from a declining USD. Merck’s KEYTRUDA(R) (pembrolizumab) Significantly Improved Overall Survival and Progression-Free Survival as First-Line Treatment (Tuesday 1/16/18). The actual results were not detailed in this press release, but were scheduled to be presented later at a medical conference. I would agree with the Morningstar analyst that this was an expected result. Keytruda is the only reason that I will play Merck stock now. That drug does have first mover advantage in small cell lung cancer. Morningstar has a fair value estimate of $65, as of a 1/16/18 report. I am just raking up short term trading gains while the market is so hot. The general goal is to have a net short term trading profit between $15K to $25 by year end as a supplement to long term capital gains, dividend and interest income. PG reported earnings the day after I sold this lot. Investors did not like the slight decline in margins. Why Procter & Gamble’s 2Q Margins Disappointed Investors-Market Realist Margins were negatively impacted by competition and rising commodity costs. The shares closed at $91.89 prior to the earnings release and at $89.05 the next day or -$2.84 per share. My "buying program" for PG is to buy up to two more 10 share lots with the next purchase being below $86.5. The decline last Friday was probably in sympathy with Colgate whose earnings reflected pricing pressures and challenging growth. Colgate Announces 4th Quarter 2017 Results; Colgate's sales disappoint despite price cuts, higher ad spending: Reuters I already knew about those issues, as did the market, from PG's report released earlier in the week. 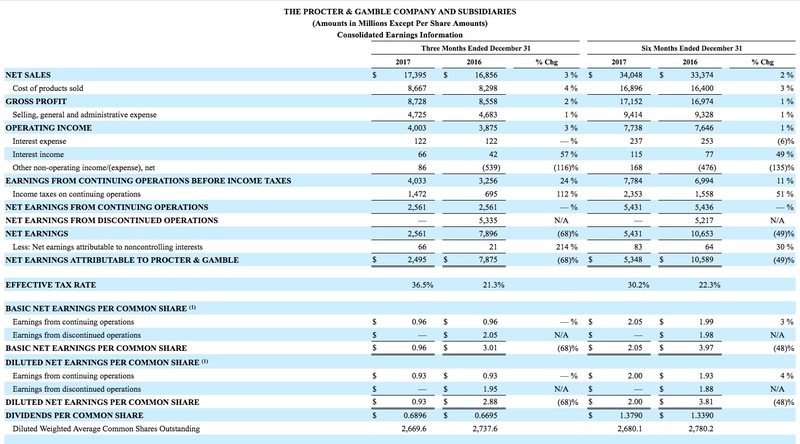 PG at least has several business segments showing organic growth. I do not currently view PG favorably, but I will buy shares as trades. For the reasons discussed below, I did not have as unfavorable opinion about the last earnings report as the market. The problem is tepid growth that is reflected in the stock's total return over the past decade or so compared to the S & P 500. The current bull move started after the S & P 500 closed at 676.52 on 3/9/2009. Seems like ages ago. If I had bought SPY at the closing price on 3/9/2009, my total return through 1/25/18 would have been +384.44%. Buying PG on the same day would have produced a +165.75% total return. The price went up above 100%, rising from $44.18 to $88.31. The remainder of the PG's total return comes from the dividends and dividend reinvestment. Starting in March 2009, I bought a number of consumer stable stocks. That approach is my preference after a 40%+ decline in the market. Consumer stable stocks would decline with the market, but the overall percentage decline would generally be less than the S & P 500. I did buy PG at $47.59 in March 2009 and then sold that lot at $56.49 about 4 months later. I then bought 100 PG shares at $52.85 in September 2009 and then sold that lot at $59.45 in November 2009 and so on. Considering that I sold a 100 share lot at $59.45 over 8 years ago proves sub-optimal performance compared to a low cost index fund since the Near Depression. In the past, my preference was to buy this stock in the 15-17 P/E range using a 12 month forward E.P.S. estimate. The E.P.S. estimate for the F/Y ending in June 2019 is $4.52, and that results in a 19.54 forward P/E. A 17 P/E on $4.52 would be $76.84, so the current price is well above what I would like to pay for this stock. Basically, as I see it, PG is selling relatively high cost brand products that many consumers view as not worth the price. I have mentioned here, for example, that I have found razor blades as good or better IMO than Gillettes blades at a lower cost. PG had to reduce prices on Gillette razors during the quarter, and organic revenues in the shaving segment declined by 3%. Before wringing my hands too much in response to that information, there were positive organic increases in the beauty, health care and fabric/home care segments as shown in the snapshot above. PG also raised its outlook for core earnings from 5% to 7% to 5% to 9% for the fiscal year ending in June 2018 versus the 2017 core E.P.S. of $3.92. PG took an accounting charge of $3.8B relating to the repatriation tax on foreign earnings that had not yet been repatriated to the U.S. This is an accounting charge. The tax will be paid over 8 years as stipulated in the recently passed tax legislation. I will consider buying back shares at less than $34. The range on 1/25 was between $79.46 to $80.11. The 52 low was then at $78.2 with the 52 week high at $86.16. On the days of purchase, it was an unusual correlation day between REIT prices and interest rates. The 10 year treasury bond yield declined to 2.63% from 2.65% the prior day. Daily Treasury Yield Curve Rates REIT prices were behaving as if the opposite was happening, a move from 2.65% to 2.67%. I thought that the incongruence was worth a 5 share buy of this low cost REIT ETF. I doubt that the downdraft in equity REIT stock is over, particularly if the ten year treasury makes a sudden move to 3% and then higher. TRST did report its 4th quarter earnings after my last purchase and possible some investors sold shares based on a misunderstanding. I discussed that report in a previous comment. As noted there, the report contained the usual noise item about a revaluation of TRST's deferred tax asset. The revaluation resulted in a non-cash charge to GAAP E.P.S. of $5.1M that was classified as an additional income tax expense even though no additional taxes were paid by the bank. The reduction in the top corporate tax rate to 21% means that the deferred tax assets is worth less than under prior law. I have been explaining that item which screws up GAAP E.P.S., ROA and ROE numbers for the quarter. It is best just to ignore it which some individual investors may not be doing. TrustCo Announces Fourth Quarter and Full Year 2017 Results; Net Income Before Taxes Up 12.9% Over Prior Year Quarter The result is that GAAP E.P.S. declined to $.076 from $.113 in the 2016 4th quarter. However, net income before that charge was up 12.6% Y-O-Y. For the 2017 4th quarter, the efficiency ratio was good at 53.13%; the charge-off ratio was excellent at .02% annualized; the NPL ratio was at .67% which is okay at this stage in the credit cycle; the NIM expanded 16 basis points to 3.29% and the coverage ratio remained good at 1.8x. If I buy another lot, it will be at lower price and placed in a Roth IRA account. The market had a more favorable opinion about VLY's 4th quarter earnings report than I did. I thought that the report was more of the same. VLY would have had an effective tax rate of 25.5% without that non-cash tax expense and expects an effective rate of 21% to 23% in 2018 taking into account "the impacts of the Tax Act, tax-exempt income, tax-advantaged investments and general business credits." So that decline is not that meaningful compared to other regional banks that I own. 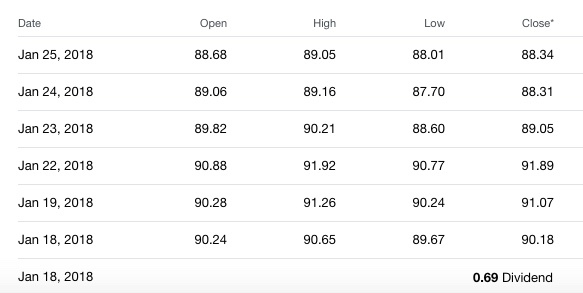 Assuming a price decline to $11-$11.2 before the next ex dividend date, I will consider buying back some or all of the 60 shares sold in this account. I now own 2 bond, both in this IRA account. Yes I know that this is an intermediate term bond, but it does give more yield than a MM account and the interest is tax free when owned in a Roth IRA. The credit risk is consistent with what I want to own now in my Roth IRA accounts. I am about one month behind in discussing the short term bond/CD trades due to the volume of trades. Interest rates for these short maturities have inched up some since my purchases causing the bonds to drop a few basis points. I am not concerned about that decline and even welcome it given the constant flow of redemption proceeds that can then be used to buy higher yielding securities. More current trades can be found simply by clicking the Finra links. The Cardinal Health bond discussed in Item #4.A. below closed last Friday at 99.263. My purchase was made on 12/28/17. I paid 99.570. I used the proceeds from this maturing CD to purchase this short term GS SU bond. I had a 1.35% Deere SU bond mature on 1/15/18. Over the past several months, I have been lowering my duration risk for EBAY's senior unsecured debt. I sold EBAY's exchange traded senior unsecured bond, EBAYL, at $26.67 last September. Item # # 2.A. I still own 2 EBAY 2.2% SU bonds maturing on 8/1/19: Bond Detail I intend to hold those bonds until maturity. That 2 bond lot was bought on 12/19/16 at a total cost of 99.941. I also currently own Duke Energy Carolinas First Mortgage bonds and Duke Energy senior unsecured bonds. I will sell $1K whenever I see the position value go over $51K. This is an automatic trade when I first notice that the value exceeds that amount. Given the robust move in the stock market, there was only a few days since my last pare. I am already close to another pare.